Whether you are new to Maple or an experienced Maple user, this guide provides extensive information on Maple programming, from basic to advanced topics, including many examples. 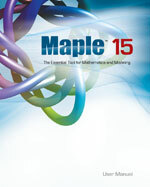 Maple users will benefit from learning about expressions, data types, data structures, looping, procedures, and modules. In addition, this guide also covers more advanced topics such as parallel programming, connectivity, and testing and debugging.